Roller skates measurements are 4" x 3 1/4" x 3", with a 1" diameter perch. Roller Skates Trick Training Toy for Cockatoo/Macaw Size Parrots5Sarah HoeftJune 26, 2014I had no problems getting the birdies used to these. 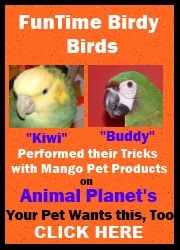 They are very well built and have the perfect height for my birds. They are made from heavy acrylic and will last for years with the toughest of birds I'm sure. Thank you!!! We love them! Roller Skates Trick Training Toy for Cockatoo/Macaw Size Parrots5PicaboMay 18, 2011I'm still getting used to seeing them and perching on them. I haven't yet tried to move my legs but I'm getting plenty of encouragement from my parronts. The skates are very sturdy and durable. I've tried to chew them but even my big beak doesn't leave a mark! I'm sure they'll be great for getting around on once I get my feet moving! It's all very exciting! Thanks Funtime Birdy! I won't be bored any longer - hehehe!